c. Keep it dry and avoid wearing it when bathing, doing housework and swimming. 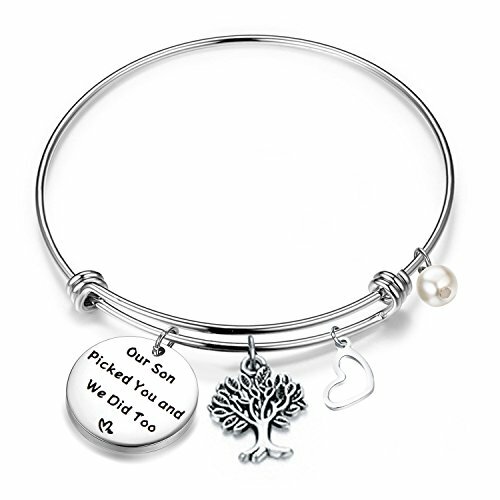 ❤Daughter In Law❤Heart Bangle with the loving quote, "Our Son Picked You and We Did Too," with a family tree charm to welcome your future daughter in law into your family; with a love heart pendant on this stepdaughter bracelet. ❤Wire Bangle Bracelet❤Personalized appreciative gift sure to be loved by the one who receives it.Celebrate your new daughter with a keepsake that she can wear and cherish knowing that you were welcoming her into your lives with open arms. ❤Material&Measure❤Stainless steel will not tarnish or change color. It is also a great choice for those with skin sensitivities. ; Our son pick you pendant: 0.79inch(20mm)diameter; The bangle is adjustable, fit most people's wrist from 7" to 8.5". ❤Package❤This wedding bracelet will come beautifully packaged in a elegant velvet cloth jewelry pouches, and ready for gift giving. If you have any questions about this product by FEELMEM, contact us by completing and submitting the form below. If you are looking for a specif part number, please include it with your message.